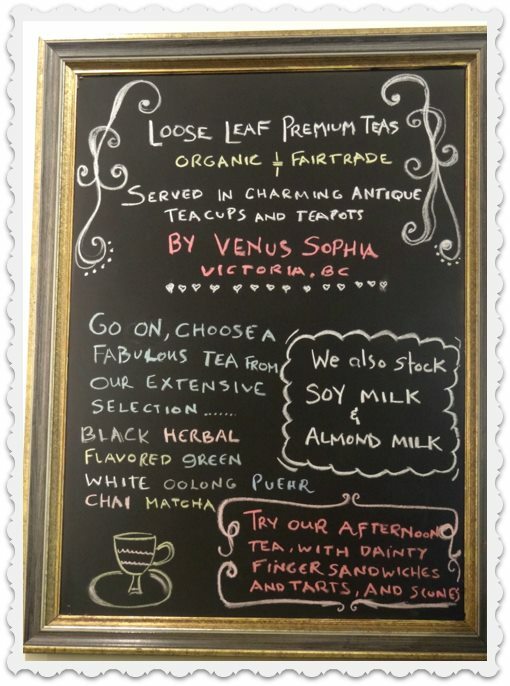 Venus Sophia Tea Room & Vegetarian Eatery isn’t a name that you’d expect to find in a Chinatown…but that’s what adds to the fun. This final stop in a rain drenched Victoria, BC last fall was a delightful discovery. The space was light and bright and managed to feel cozy despite its cavernous size and industrial ceiling. The menu featured vegan options and gluten free desserts; tea choices included a large variety of custom blended organic teas. My pink quinoa salad with mango and beets was perfectly fresh and filling. Service was friendly and knowledgeable. Whether you order a tea latte to go, enjoy a relaxing lunch or splurge with a high tea, it’s obvious the owners (a husband/wife team) take pride in creating specialty items with a nod to healthy eaters and sippers. And that’s a welcome combination in any country. Update note: Venus Sophia is thriving and celebrating their 3 year anniversary throughout April. Check out their Facebook for chances to win gift . You’ll also find some yummy recipes!